Ready To Try A Few New Types Of Butter? Then This Article Should Provide Some New Ideas For You! What? There’s actually more than a dozen different types of butter?!?! Apparently so….. There is healthy butter made from organic milk, flavored butter made with spices, and even a kind of butter called “ghee” which has all the moisture removed from it. Many companies have taken the chore of making butter into an art, and gone far beyond plain unsalted butter and margarine. The US Department Of Agriculture has set the standard for the various types of butter we’re going to talk about by naming three different grades of butter. These standards not only make a statement about the quality of the butter, but also says that the product has been produced in an approved plant in a sanitary environment. Grade AA has the best “spreadability” due to using high-quality cream, and having the most pleasant aromas. Grade A rates closely with AA but is less smooth and the cream will not be the freshest, but still fairly fresh. Finally, Grade B will have a slightly acidic flavor, though it’ll still be acceptable for use. What Else Could Be Found At Your Local Grocery That You May Have Overlooked? Funny You Asked Because We’re About To Tell You! 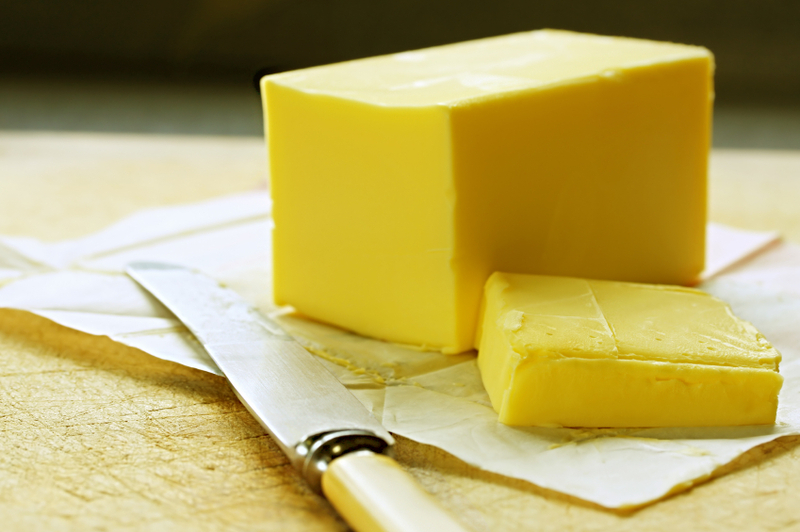 These are the most common types of butter you’ve probably eaten your entire life. Salted butter is used mostly to preserve the freshness of the cream, and to store at room temperature. Unsalted butter is the best butter for baking as the lack of salt won’t affect the flavors you’ll be adding to whatever it is you may be cooking. Both types are 80% fat, and only European cured salted/unsalted butter will have more fat at 85%. 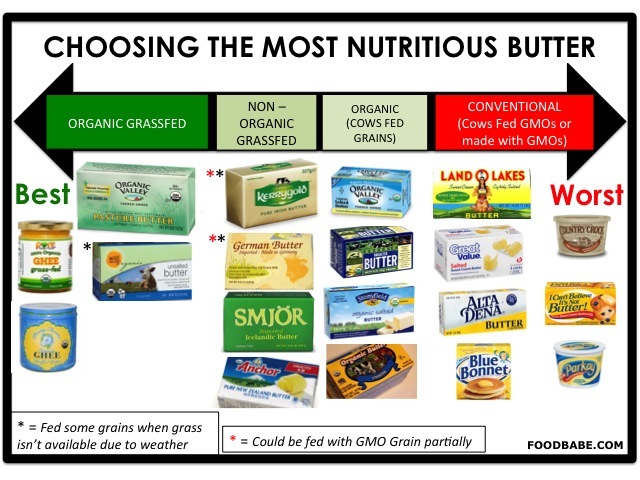 Many Butter Customers Have Different Concerns Which Will Affect What They Buy, So Here are A Few Tips For Buying Grass Fed Butter……. These are the best if you’re looking for butter that’s free of antibiotics, pesticides, and growth hormones. It’s going to cost extra money, but if you’re concerned about what the cows who produce the milk for your butter are taking in, then you should look for this in your grocery store. Because these cows will graze in a pasture for several months out of the year, the cow will be healthier and produce a fresher, more natural dairy product. Kerrygold and Anchor butter are two grass fed butter brands you should seek out at Whole Foods, Trader Joe’s, or any farmer’s market or natural foods store. This is a type of butter that has been heated to separate oils from the cream, and to reduce the moisture as much as possible. Why would you want to heat the butter? So you can use it for cooking methods that require high temperatures like frying or sauteing. It’s very popular in cuisine you’ll find in Southeast Asia like Thai and Vietnamese. This one can’t be left out at room temperature for long though as it’ll turn into liquid! These are just a few types as there’s also whipped butter, butter blends, and the many flavored butters with garlic, for example, added into the churning process. If you’re looking to widen your cooking repertoire by using different types of butter, you’ll need some good containers to store it all. We highly recommend looking into using a butter crock, as they can keep butter for as long as 30 days at room temperature. Then there’s a simple butter dish that you can use after you removed the paper or other covering your butter will come in. Educate yourself on the best ways to store your butter, and only use the best materials that you can find! Thanks for reading, and enjoy the journey as you explore the different types of butter.